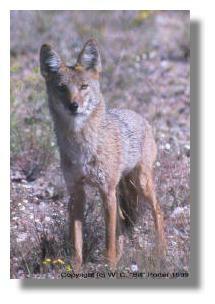 Bill's Coyote Hunting Home Page - Learn how to hunt & call coyotes! The following pages will attempt to share a bit of knowledge that I've gained about where to hunt coyotes, how to call coyotes and other predators or varmints. Like fox, bobcat, and even badgers. There's information here about types of calls to use when calling coyotes and, other related tidbits for coyote calling. Information that I hope you'll find useful in your coyote hunting experiences. Using and honing your own skills, along with some easy-to-learn, rudimentary rules of concealment and common sense while in the field, can lead to a lifetime of fun and enjoyment observing coyotes and other creatures of the wild. 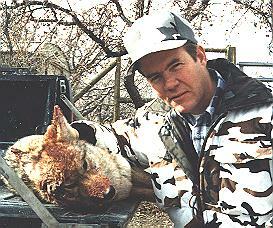 This website was originally created in 1998, to share my love and knowledge of hunting coyotes with others. There wasn't a lot of information about the subject back then. While the "art" of calling coyotes --or other predators-- can be learned and used merely for nature loving folks to observe the coyote. The original auspices of this website was, and still is, about hunting the coyote. Some do this as I do for predator control and attempting to photograph them. Maybe to add a piece of fur to ones wardrobe or, just for the challenge and sport of it. So please be aware that there are photographs of dead and bloody animals contained within the associated pages. By popular demand, Bill has created an instructional, 30 minute audio cassette on "How To Call Coyotes." Order now and your order is shipped FREE! Bill & Kathy's Home Pg.